Schooling from the heart: A visit from the stork(s)! A visit from the stork(s)! We've seen a few of these white storks around here this summer-- both munching in the fields and flying past the windows-- but we had no idea there were so many! Sunburst spotted these out the window today, and the kids and I sprinted outside to watch them. We were mesmerized. 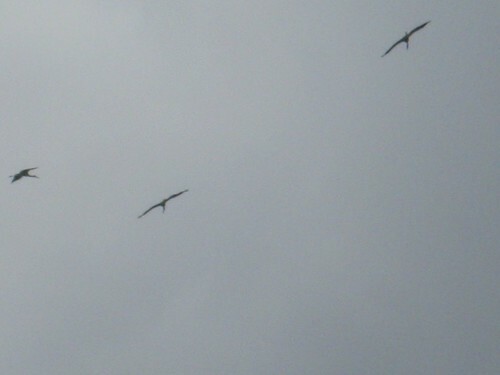 They flew over the house and circled around in the sky above our back garden for about five minutes before they flew off. The weather has been cold and wet for the past week, so I wonder if they are getting ready to head South to Africa already?!! I don't blame them. The timing is pretty fun because our neighbor is getting ready to have a baby. 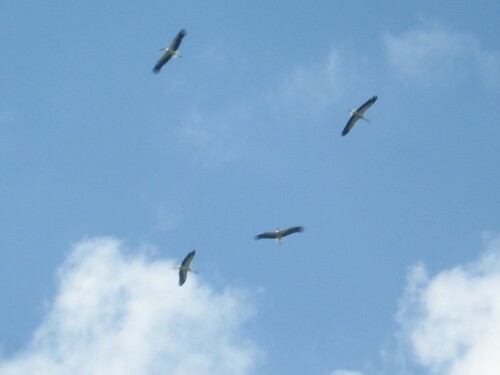 We saw one of these storks land on her roof the other day, and the kids laughed and laughed about it. The stork party in the sky today was a good reminder that I MUST finish knitting up that baby gift. And soon! 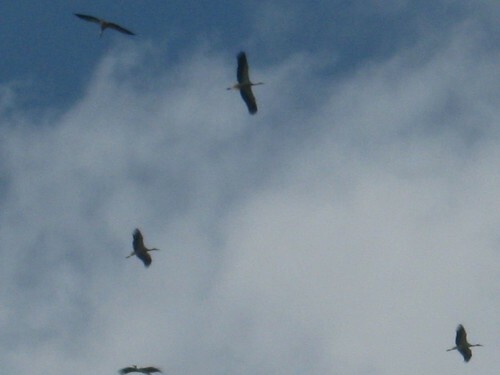 I tried to zoom in on the storks and I got these very grainy almost prehistoric shots. I don't know why I find them so pleasing, but I do. Sunburst counted about two dozen of them while I was snapping pictures. What a sight they were!! Oiii, I adore this! 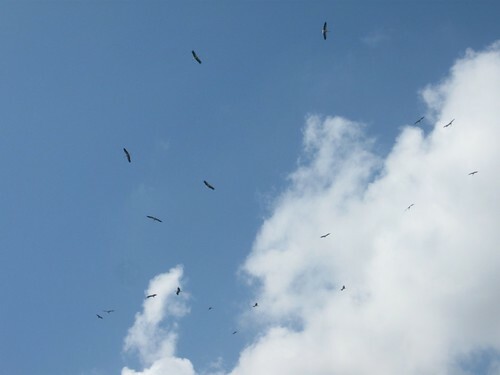 We almost never see storks here...and then you saw so many! I like the story about your neighbour...and funny how people of so many different cultures believe that babies are brought to them by the stork ;O) Aaand I loove the photos! Last night was the Swiss Day celebration for the small villages, and the fireworks spooked the storks-- so much squawking! Someone must have set off fireworks too close to their nests in our little forest. Poor things! Teresa, I actually have two mama's I'm knitting for right now, both due in the next 2 weeks. Ack! I will certainly show off the projects when I have them done. Sunburst has all but finished her knitting for them, too. She is so much quicker than I am these days! I might have to hire her to help ME finish. Lol. I'll bet she'd be so tickled to have you hire her! =) Can't wait to see the projects...you are one busy gal!